Labor Force. Outlook Issue 1. Over the next two weeks we will be meeting with our advisory groups to discuss and finalize the economic outlook. The economy is currently on the upswing and the questions become how strong will the growth be and how long will it last. So far the recovery is largely on track, however job growth in recent months has been above forecast (more on that Wednesday). Two fundamental aspects to the Oregon economy are our more volatile economy and our ability to attract in-migration in both good times and bad. Much of our meetings and discussions will focus on these items and Kanhaiya was been working on lots of good, new migration information. However two places where these will manifest themselves in the economic data are in the labor force and employment figures. Below is an updated snapshot of Oregon’s labor force and participation rates. Wednesday I will focus on the latest job figures relative to our forecast. 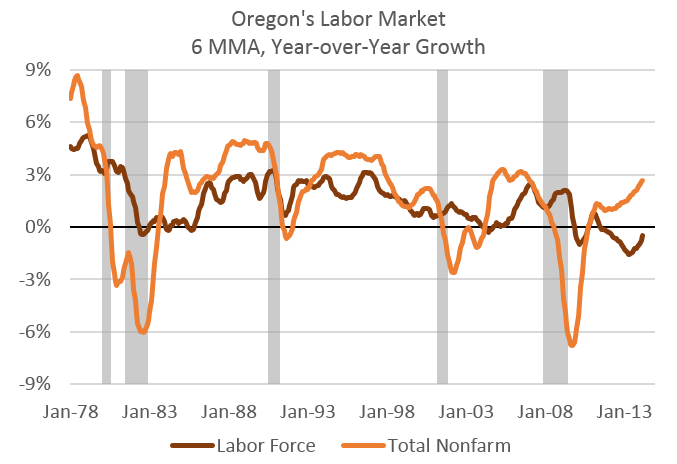 As discussed in more depth previously, we are now starting to see the labor force response in Oregon. As job opportunities continue to increase and employer behavior picks up, so too are the number of Oregonians looking for work. In fact, on a monthly basis the labor force has increased in each of the past 5 months and is nearly back to showing gains over the year. So long as the recovery continues — and it should — expect these trends to continue. In terms of the participation rate itself, here is Oregon’s overall rate compared with the U.S. in the top graph. Up until the early 2000s, Oregon long enjoyed a participation rate advantage relative to other states, however now Oregon is largely matching national trends, or actually below based on the latest data point from 2013. There are a number of reasons for these changes, but two important ones are declining participation rates for certain age groups and also the overall aging of the Baby Boomers. At last look, Oregon had a larger Boomer cohort than the average state, which during their prime working ages was great in terms of LFPR, however as they age into the latter stages of their working careers and even into retirement, participation rates fall. Even if 65 year olds today work at a higher percentage than a generation ago, they still work less than the typical 45 year old. The second factor is declining participation rates for different age groups, which can be seen more clearly in the second graph below. About a quarter of the overall LFPR decline can be attributed to falling rates for teenagers and college age Oregonians, the Employment Department found in their report last year. The Great Recession was rough for nearly everyone, however it was disproportionately bad for young Oregonians (see here for more) however the silver lining of falling participation rates among the younger cohorts is increased college enrollment. To the extent that these Oregonians furthered their education, they should become even more productive workers moving forward, which is good news for the economy. 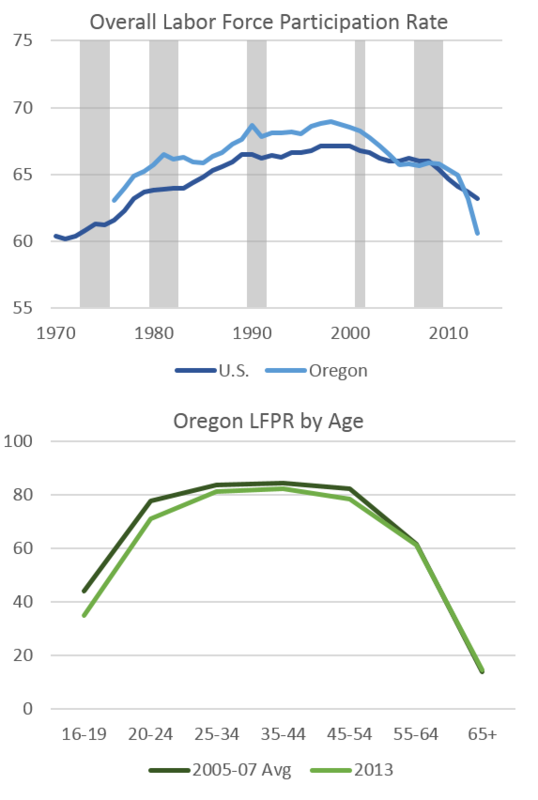 The last set of graphs looks at Oregon’s LFPR by age cohort relative to the U.S. rates. These are 3 year averages to help smooth the data and are percentage point differentials (Oregon minus U.S.) That means, positive values indicate that Oregonians in that age cohort have a higher participation rate than their national peers, whereas negative values indicate lower participation rates. There’s a lot of information packed into these graphs about not just age cohorts but also generational trends and economic factors and the like. However a few items stand out to me. First, prime working age Oregonians (generally defined as 25-54) used to have a higher participation rate than the nation throughout the 1980s and 1990s, however during the 2000s through today this higher rate has dissipated and Oregonians in these age groups are about as likely to work or look for work as the national average. This goes a long way to explaining Oregon’s top line decline relative to the nation, however it is also likely, at least somewhat, to be a generational shift and as those individuals (the oldest Boomers) aged into the 55-64 year old cohort, participation rates there perked up. These trends of Oregon’s prime working age individuals participating along national averages is not a concern today, however it may be one indication that Oregon’s relative economic growth rate may not be as strong as in previous decades (given our labor supply is somewhat less than it used to be). However, as the economy improves it will be important to watch participation trends (and jobs and income) among the Millenials to gauge future growth. Second, while Oregon has long been a top destination for in-migration, the state does receive its share of retirees as part of the migration. This is at least part of the reason that 65+ year old Oregonians have a lower LFPR rate than their national peers. There will be two factors pulling this in opposite directions moving forward. First, expectations are Oregon will continue to see retirees migrate to the state, weighing on rates. However as the Baby Boomers age, they are working more than previous generations did, thus pulling up participation rates. Expectations are that LFPR for Baby Boomers will continue to rise, which is largely good news for the economy given they are as highly educated and productive a generation as we have seen, however Oregon’s relative position compared with the nation is unknown at this time. Overall, stronger job gains and more migration will likely result in a larger labor force in Oregon, helping to foster stronger economic growth in the state. At this point in the business cycle, these represent upside risks to the outlook, which we will be discussing in more depth with our advisors ahead of the forecast release on May 28th.